The blood vessels are the part of the circulatory system that transports blood throughout the human body. 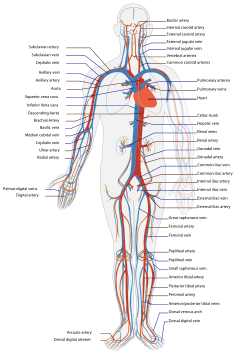 There are three major types of blood vessels: the arteries, which carry the blood away from the heart; the capillaries, which enable the actual exchange of water and chemicals between the blood and the tissues; and the veins, which carry blood from the capillaries back toward the heart. The word vascular, meaning relating to the blood vessels, is derived from the Latin vas, meaning vessel. A few structures (such as cartilage and the lens of the eye) do not contain blood vessels and are labeled. Tunica intima (the thinnest layer): a single layer of simple squamous endothelial cells glued by a polysaccharide intercellular matrix, surrounded by a thin layer of subendothelial connective tissue interlaced with a number of circularly arranged elastic bands called the internal elastic lamina. Tunica media (the thickest layer in arteries): circularly arranged elastic fiber, connective tissue, polysaccharide substances, the second and third layer are separated by another thick elastic band called external elastic lamina. The tunica media may (especially in arteries) be rich in vascular smooth muscle, which controls the caliber of the vessel. 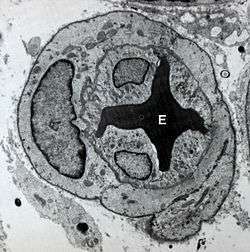 Veins don't have the external elastic lamina, but only an internal one. Tunica adventitia: (the thickest layer in veins) entirely made of connective tissue. It also contains nerves that supply the vessel as well as nutrient capillaries (vasa vasorum) in the larger blood vessels. Resistance occurs where the vessels away from the heart oppose the flow of blood. Resistance is an accumulation of three different factors: blood viscosity, blood vessel length, and vessel radius. ↑ "Nerves and blood vessels". 420evaluationsonline. Retrieved 2 August 2016. Wikimedia Commons has media related to Blood vessels.